The nanoKEY MIDI controller is part of Korg's nanoSERIES USB-powered slimline controllers that are so small you can put them on your workstation, in front of your laptop, on a recording console, or anywhere else you need versatile control over your DAW, virtual instrument, effect, or DJ software. Despite it's small size, the nanoKEY MIDI controller goes big when it comes to functionality. Its intuitive layout provides extremely easy operation for any user. The nanoKEY features a great-feeling, 25-key velocity-sensitive keyboard that's ideal for song production. The keys can also be set to send MIDI control data, further expanding its power. When Korg set out to build a slim-line MIDI controller keyboard, they used their years of experience in manufacturing innovative MIDI keyboards to create a comfortable-feeling, velocity-sensitive keyboard based off a laptop keyboard. The resulting 25-note keyboard on the Korg nanoKEY will transmit your playing dynamics to your software accurately and expressively. In CC (Control Change) MODE, the keys become MIDI controllers, allowing you to control any MIDI-assignable parameters within your software. With the "KORG KONTROL Editor" (downloadable free of charge from korg.com), you can customize the nanoKEY to match your control needs. It lets you select between three velocity curves or fixed velocity, and set MIDI CC values. It even allows you to edit the assignments for the minimum and maximum values of the control change messages transmitted by the modulation buttons or in CC MODE. 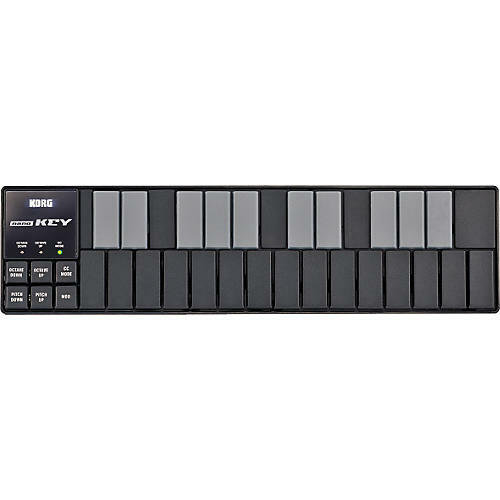 Even if the Korg nanoKEY controller is your first foray into MIDI control, be assured that you'll be able to get connected to software quickly. As an added value, the nanoKEY includes a download code for the full version of Korg's M1 LE which faithfully recreates the legendary Korg M1 workstation. Plus, an upgrade path will let you graduate to the Legacy DIGITAL EDITION software suite, which has an even more expansive version of the M1, the renowned WaveStation, and 19 great MDEX effects. You also get a free downloadable Editor/Librarian to help you create setups to suit your specific control needs.